It is that time of the year in India when our very own country dresses up like a bride with bling and fireworks all around the place. Everyone wants to look super stylish in their favorite traditional outfits. So, we thought of coming up with some really quirky ideas to spice up your Diwali outfits this year. These are not just some ordinary Diwali Outfit Ideas, these are outfits you can create with your existing wardrobe just by styling them differently. We believe that almost everyone has that one ethnic dress sitting in their cupboards, waiting to be styled uniquely. It is finally time to take that out and style it as per 2018 fashion standards to look fabulous this Diwali. Read on to see a few carefully curated looks for Diwali. 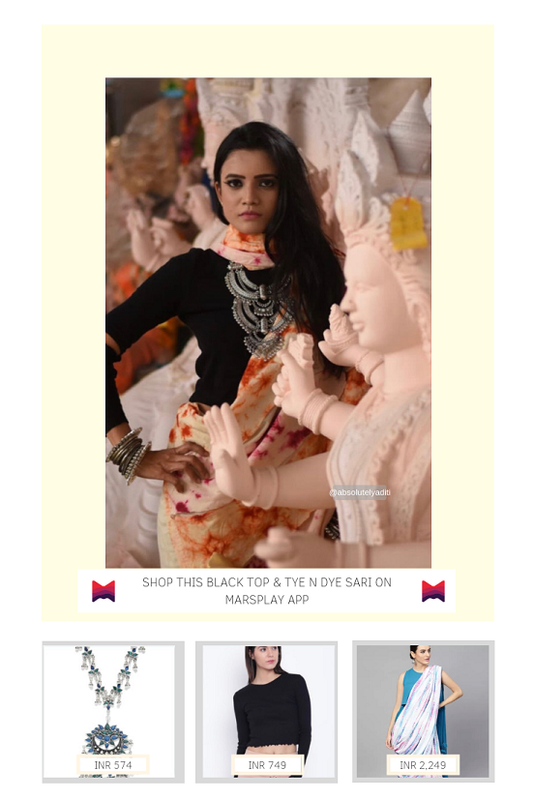 Do not forget to SHOP what you LIKE directly by simply buying the looks you like from Marsplay app. Foil prints and brocade work are in trend this year. You can totally replace the bling of a typically heavy work suit or lehenga by foil prints and brocade work instead. They are subtly flashy and the intricate work details add spark to your diwali ensemble. Style this look for your Diwali Card Parties. Marsplay recommends Brocade juttis to slay on the #gram. Are you a minimalist when it comes to dressing up traditionally? If yes, let your “Dupatta” do the talking while you dress up minimally otherwise. Choose a pastel colored suit and add some spice to it by teaming it up with a bright and heavy work dupatta. 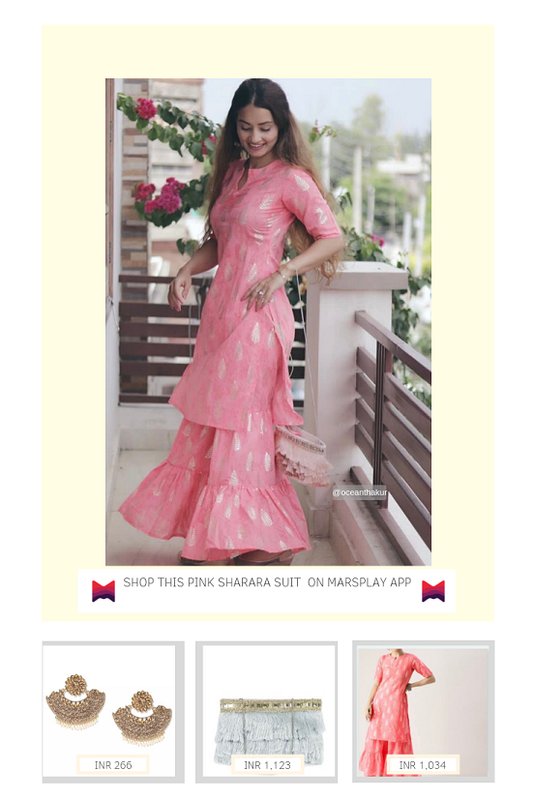 Go for Chanderi silk to add that Indian touch and elegance or add a heavy colorful phulkari work dupatta to make your basic patiala suit, uber stylish. If mirror work is your thing, do not shy away from pairing it up with a basic chikankari suit and lastly, try pairing a heavy, colorful floral print dupatta with a georgette or chiffon suit to add that extra oomph. 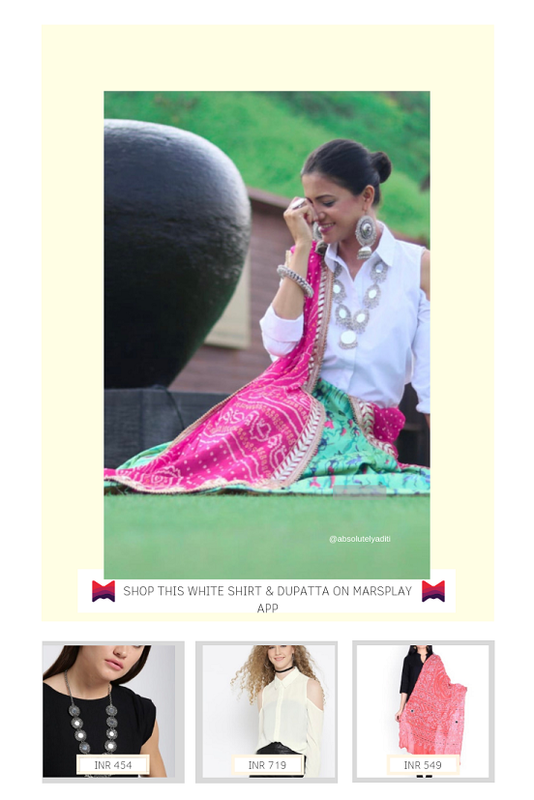 Pick your white crop top or even a shirt and pair it up with a bandhni dupatta and an ethnic skirt. Make sure to drape the dupatta to create the look of a lehenga. You are sure to grab some eyeballs for the styling effort you put in this almost effortless outfit. Wear your favorite black crop top as a blouse and team it up with your mother’s favorite silk sari to create a modern Indian Ethnic look. Throw in some traditional ethnic jewelry pieces to complete the look. Marsplay recommends wearing a cold-shoulder full sleeves top to be worn as a blouse to create that perfect modern ethnic look. 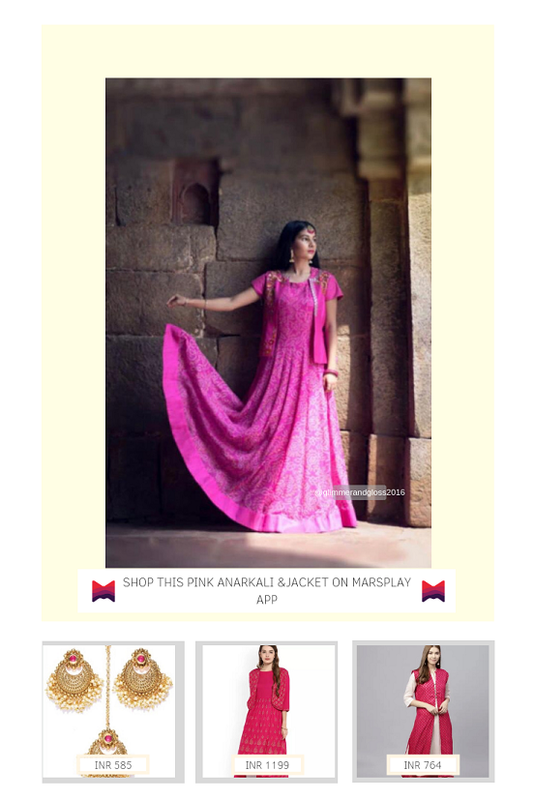 Remember buying your anarkali suit last season? We bet you wore it 2–3 times already and are in no mood to repeat it. Well, don’t but simply recycle it to create a fresh look this time. Wear it without your dupatta and pants. Yes! Wear it alone as a floor-length dress. Pair it with beautiful kolhapuri chappals and you are set to rock that festive party. Check out these denim jackets to complete the look. Well, this look is an absolute street style favorite. Jazz up a basic outfit by simply wearing your heavy dupatta as a shrug by pinning both the ends in the middle as shown in the image. Or you can also belt it up for a more chic look. Wear it on your next visit to your friends and relatives and show off what you just learnt. This one is another Anarkali look where you can totally ditch your Dupatta and Pants for a Shrug to be worn like a jacket over your Anarkali to completely up your layering style game. Try using two contrasting colors to create color blocking outfits. Gone are the days when suits were worn only with pants or chudidaars. 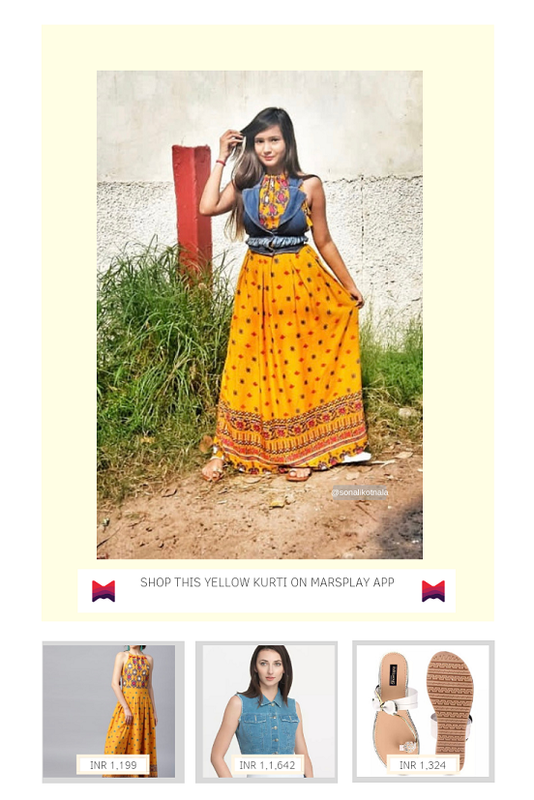 Welcome the latest fashion trend of wearing an A-line kurti with a flared skirt or an ethnic skirt with a crop top. Make sure the skirt you choose is an ethnic one to dress for the festival season. Pair the outfit with bold and beautiful statement earrings to complete the look. These pieces are going to become the star of your outfit. Check out these stunning pairs on Marsplay App. How could we forget Shararas and how beautiful they look on occassions such as diwali. Keep your shararas in cream and gold to look elegant and accessorize with chandbali earrings to finish the look. This is one of the most loved looks by celebrities. Patiala Salwars are just so versative and festive. Style them with a casual denim top and you are all set to rock the bohemian trend. Do not forget the tassel earrings, white sneakers and embroidered sling bag to complete the look. 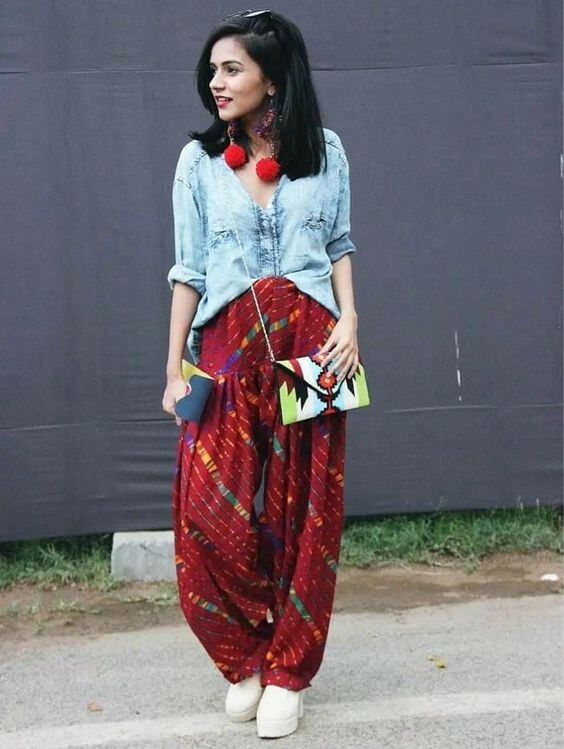 This look is one of the most loved street style way of styling a patiala salwar. So what are you waiting for? Go shop! This indo-western fusion look is trending these days and is a perfect example of a very well #mismatched look. Mixing ethnic blazer with Dhoti Pants adds so much style to the ensemble. Add a bralette to complete the look. This look is perfect for your Diwali parties or club gatherings. Be sure to turn a lot of heads. Style these looks and you will be all set to rock the traditional trend this festive season. Don’t forget to tag us in the looks you create this Diwali.